Alumni Voices with Jane O’Reilly: The Notations of Cooper Cameron Cover Reveal! 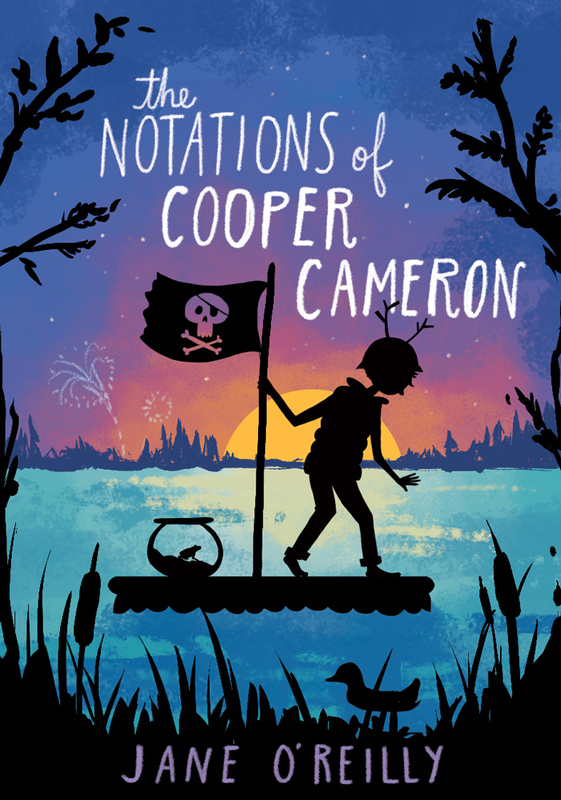 I am thrilled with the cover for The Notations of Cooper Cameron. It was designed by the amazing artist, Julie McLaughlin, who managed to squeeze just about the whole book onto one page. The groceries are a big and important job. Food is sustenance. Food gives life. Yes, he can bring in the groceries. He will bring in the groceries to make his mother happy. The cereal boxes and chips and cookies fit into place on the open shelves like puzzle pieces. Soup cans and salt and cinnamon and many other red-capped spices are stacked in perfect rows. The groceries are snug and safe, like ancient cliff dwellings packed into the mesa. Everything fits. And it is beautiful. “Cooper, what in the world. . .?” His mother says. His mother squeezes Caddie’s hand to keep her quiet. Smiles at Cooper. He sees her think he doesn’t know. Sees her pretend everything is okay and he aches with this lie. Eleven-year-old Cooper Cameron likes things to be in order. When he eats, he chews every bite three times on each side. Sometimes he washes his hands in the air with invisible water. After the death of his beloved grandfather, Cooper invented these rituals, believing he could protect those he loves from terrible harm. When Cooper’s strange behavior drives a wedge between his parents, and his relationship with his older sister, Caddie, begins to fray, his mother’s only solution is to take Cooper and Caddie to the old family cabin for the summer. Armed with his prized possessions—a collection of rocks, his pet frog and pocket-sized notebooks in which he records his observations of the confusing world around him, Cooper vows to cure himself and repair his damaged family. Jane O’Reilly is a 2009 graduate of the Hamline MFAC program. Her first book, The Secret of Goldenrod, which published on October 1, 2016, received starred reviews from Kirkus and Booklist, and was named a Junior Library Guild Selection and a “Kirkus Best Book” of 2016. Jane is also the recipient of a McKnight Fellowship in screenwriting. Her forthcoming book, The Notations of Cooper Cameron, about a boy with OCD, was inspired by the childhood of her older sister, Catherine. Just like Cooper, the main character, Jane spent many summers at the family cabin in the North Woods. Although their children live out of state, Jane and her husband remain in their hometown of Minneapolis with their elderly cat and brand new puppy. Wow, way to go Jane! How do I get a signed copy? awe makes me cry! and I like that illustrator a lot!